The 2.0-2.5 tonne pneumatic tire forklift is an excellent option for combined warehouse and yard applications. TEU is a professional manufacturer and supplier of various forklifts. The company is dedicated to producing forklifts that range from 1.5-10 tonne in capacity. They are highly recognized due to their quality and excellent service. Our 2.0-2.5T LPG Forklift Trucks have gained the ISO9000:2008, CE and SGS certification. The gasoline engine is energy-saving and powerful. It is equipped with an efficient and reliable hydraulic transmission system. 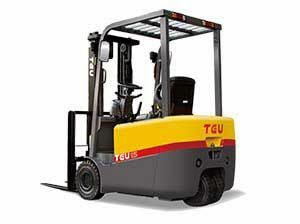 TEU 2.0-2.5T forklifts are designed to meet a variety of safety standards and specifications. It can meet the needs of various harsh working conditions. The 2.0-2.5T LPG Forklift Truck is easy and convenient for maintenance, with access to the engine and transmission without the use tools. The built-in tilt cylinder provides enough space for a driver to rest his feet. The spacious cab option, with includes a heater and wipers, allows drivers to operate and enter and exit the forklift easily. The LPG tank holder is well designed to swing out and lower for more convenient changes.